Didi Hirsch Mental Health Services has provided free mental health, substance use disorder and suicide prevention services since 1942. Dedicated to serving communities where stigma or poverty limits access, Didi Hirsch helps more than 120,000 children and adults from 10 locations and 100 schools throughout Los Angeles and Orange counties each year. Our Suicide Prevention Center is the nation’s first and an international leader in training, research and crisis services. For more information about Didi Hirsch’s services, please call Centralized Intake at 888-807-7250. Hours are Monday through Friday from 8:30 a.m. to 5:00 p.m. If you or someone you know need help in a crisis, call the National Suicide Prevention Lifeline at 800-273-8255. Counselors who speak English and Spanish are available 24/7. Accessible We offer services at our centers and in neighborhood settings that are welcoming, culturally respectful and responsive to underserved communities. Comprehensive We provide a continuum of prevention, early intervention and treatment services for individuals, families and the community. Collaborative We partner with clients, families and community groups to set goals, identify priorities and evaluate results. Innovative We train staff and future professionals to use state-of-the-art principles in a culture of learning and team excellence. Accountable We produce measurable clinical and fiscal outcomes, seek opportunities for growth, and evolve as needs change to ensure our long-term viability and value. Committed We are dedicated to erasing the stigma and discrimination associated with mental illness and substance use and advocating for access to care. We envision the day when treatment for mental health and substance use disorders is held in the same regard as all other health care. When education about these illnesses promotes health and resilience. When treatment is available to all at the first sign of illness. 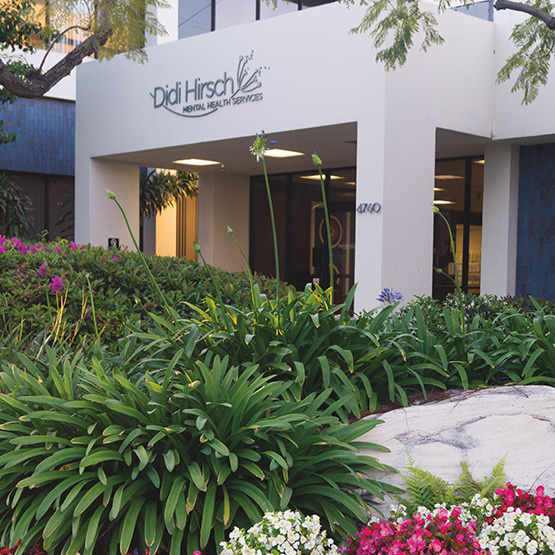 Didi Hirsch Mental Health Services was the first community-based adult outpatient clinic in Los Angeles and one of the original agencies to be federally designated as a Community Mental Health Center. Begun by volunteers, the agency had one site and a budget of $5,000 when it was incorporated in 1942. Today, it is a leading provider of mental health, substance use and suicide prevention services. The seed was planted in the 1930s when a few philanthropists saw the need and promise of psychiatric services for unemployed women affected by the Great Depression. The benefit of these services was so demonstrable that the Community Welfare Association of Los Angeles, Community Chest (now United Way) and Cedars of Lebanon Hospital (now Cedars Sinai) supported the expansion of services to both men and women. In 1942, the Los Angeles Psychiatric Service (LAPS) was established in the area west of downtown Los Angeles. It was the first freestanding, nonprofit community outpatient clinic for adults in Los Angeles County. In the late 1940s LAPS began providing services to veterans in collaboration with the Veteran’s Psychiatric Clinic. In 1953, it merged with this organization and relocated to Robertson Boulevard, near Cedars Sinai Hospital. In the 1960s, awareness of the civil rights of institutionalized mentally ill adults and a desire to reduce the State’s treatment costs, resulted in the closing of many inpatient programs. At the same time, inadequate funding resulted in a shortage of community services. In response, in 1963 President Kennedy signed the Community Mental Health Centers Construction Act, which made federal funds available for community health centers. The Board of Directors began developing a broad range of services that would meet community needs and qualify the agency as a federally designated community mental health center. In 1965, the agency received its first contract with the Los Angeles County Department of Mental Health, allowing the development of new services. In 1966, we opened a clinic in Venice dedicated to serving Latinos and African Americans and introduced a crisis-oriented, brief treatment model that emphasized clients’ strengths rather than focusing on their weaknesses. This model was an instant success. We continue to teach it to staff and interns today, and it is used throughout Los Angeles. By 1970, the agency had received federal designation as a Community Mental Health Center, with responsibility for serving residents in Culver City, Venice, Marina del Rey, Ladera Heights and parts of Palms and Mar Vista. In the early 1970s the Board mounted a capital campaign with the dream of building a center that could provide everything from community education to outpatient services. This dream was realized in 1974 with the opening of our current headquarters on Sepulveda Boulevard in Culver City. In the same year, the Culver City Family and Child Guidance Clinic merged with the agency, adding children’s programs toits array of services. In 1979, we sited Via Avanta, our family residential program for women with substance use problems and their children, in Pacoima. With the opening of the new headquarters, the agency was renamed to honor a longstanding friend and supporter, Didi Hirsch. Didi was a social worker and had seen first hand the impact of untreated mental illness. She was a tireless advocate for mental health and substance abuse services and persuaded a group of Beverly Hills philanthropists, the United Hostesses’ Charities, to begin supporting the agency in the 1960s. At the onset of the capital campaign, she and her husband, I. Kingdon Hirsch, made a generous contribution that enabled the agency to qualify for a $500,000 matching grant from the National Institute of Mental Health for the new building. In 1982, the agency opened Excelsior House, a crisis residential treatment program for adults with serious mental illnesses, and another similar program, Jump Street, in 1986. In 1986, Didi Hirsch was also among the first agencies to receive funding from the California Office of Child Abuse Prevention to provide treatment and prevention services. The agency was also a founding member of the Los Angeles County Child Abduction Task Force, one of six task forces established in the nation in 1992. Comprising law enforcement, the office of the District Attorney, the Department of Children and Family Services and Find the Children, the mission of this multidisciplinary group was to lessen the trauma suffered by a recovered child and his/her family by collaborating and coordinating services. This collaboration continues today. The economic downturn of the early 1990s drove many agencies to the brink of failure. The agency’s commitment to high need and underserved communities prompted the Board to approve two mergers. One in 1992 with Centinela Family Child Guidance Clinic resulted in the expansion of the agency’s services into Inglewood; another in 1997 with Family Service of Los Angeles preserved vital community-based services in metropolitan and South Central Los Angeles and assured the continuation of the Suicide Prevention Center, whose programs included the first free, 24-hour crisis line established in the United States. Three years before the former U.S. Surgeon General, Dr. David Satcher, declared mental health a national priority and cited stigma as a major obstacle, in 1997 the agency instituted its Erasing the Stigma Mental Health Leadership Awards to honor individuals whose efforts have helped reduce the ignorance, secrecy and discrimination so often associated with mental illness. We honored Tipper Gore in 1997 for discussing her own depression as candidly as we discuss other common illnesses. Since then, we have honored researchers and physicians, actors and writers, athletes and advocates for their contributions to the field of mental health and their efforts to erase stigma. Didi Hirsch assists over 120,000 individuals and families each year at 10 sites and nearly 100 schools throughout Los Angeles County. Services are provided at its sites in Culver City, South Los Angeles, the Pico-Union/Westlake area, Century City, Inglewood, Glendale, Los Angeles, Pacoima and Orange County. The agency participates in many coalitions including the Westside Shelter and Hunger Network; Los Angeles County Suicide Review; LAPD Task Force on Mental Illness; Impact Meetings in Service Area 5 and 8; Local Interagency Operations Network; Westside Domestic Violence Network; and the Community Partnership Council in Inglewood and surrounding cities. We also collaborate and coordinate with other organizations to provide comprehensive services to the mentally ill, e.g., Venice Family Clinic, Asian Pacific Family Center, Alcott Center, Transitional Living Center, Crenshaw Christian Center, Our House, Step Up On Second, the Center for Healthy Aging, St. Joseph Center, FAME, Benefits Assistance Client Urban Project (BACUP), NAMI Urban Los Angeles, Department of Public Social Services, Mental Health Advocacy Services, Department of Children and Family Services, Department of Probation, L.A. County Office of Education, and the Department of Mental Health, among others. In the 21st Century, the agency has continued to build for the future despite the nation’s economic volatility. Support from major foundations has enabled us to purchase and renovate three of our facilities, Jump Street, the S. Mark Taper Foundation Center, and Glendale Center. Adopted by the California electorate in November 2004, the Mental Health Services Act created a new permanent revenue source. This funding permitted the growth of services to the severely mentally ill and the expansion of prevention and early intervention services. In 2010, we began providing bereavement services in Orange County to individuals and families who have lost a loved one to suicide. In 2010 we opened our Glendale center, expanding our services to a community with diverse cultures and unmet needs. More than ever before, our services are accessible and field-based where necessary; innovative and culturally competent; promote recovery and wellness; and involve clients, family members, and the community.